The relatively recent upsurge of the role of vocabulary in foreign language acquisition has gone hand in hand with a growing interest in vocabulary testing. Learners need a certain amount of vocabulary knowledge in order to be able to operate independently in the target language. The size of a one’s vocabulary correlates strongly with one’s other linguistic competences in the target language. Therefore, much recent work on vocabulary testing has focused on estimating how many words learners know. Two vocabulary size tests have seen wide recognition and application up till now: Nation’s Vocabulary Levels Test and Meara’s Yes/No Vocabulary Test. 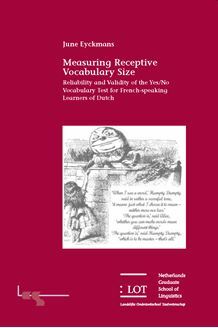 In this study the Yes/No Vocabulary Test is evaluated as a measure for the receptive vocabulary knowledge of French-speaking learners of Dutch. It concentrates on handling and suppressing the response bias that the test format seems to provoke in the test takers which threatens the test’s validity. A number of variables (the test instruction, the computer interface, the test content, etc.) that could contribute to the validity of the Yes/No Vocabulary Test are investigated on the basis of theoretical considerations as well as experimental data. Finally, an alternative vocabulary test is presented that retains many of the characteristics of the Yes/No Vocabulary Test but outperforms it in circumventing the response bias problem. This new test is called the Recognition Based Vocabulary Test. As a main conclusion, this study emphasizes that validation research should include the interaction of the test task with the characteristics of the test takers and the testing context.